Apricot Magic recipe by Tasneem at PakiRecipes.com. This light and airy dessert is sure to please. It's delicious and refreshing... perfect for summer but great anytime!! Stew well washed apricots with sugar and water in a pan till the mixture thickens and the apricots break down into small pieces(45 minutes). Next whisk together egg yolks, food colour, cornflour ,sugar and essence till a thick paste is formed. Mix the milk and 1 pkt cream and heat to the boiling point. Over low heat whisk in the egg mixture into the milk,and keep on whisking and stirring till the custard thickens. 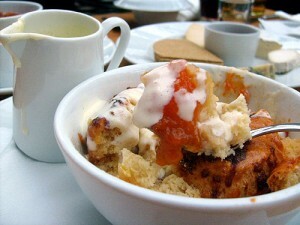 In a dessert bowl, pour in the apricot mixture, top with custard and when cool top with whisked cream and praline.